Spencer’s earliest works included constructed abstract reliefs which employed mathematics as a means of generating formal relations and structures around simple geometric configurations. During the 1970s she became a member of the Systems Group, who developed paintings and constructions organised in compositions that excluded expression or subjective emotion. Spencer’s early work was articulated by an acute numerical or geometric logic, producing sequential white reliefs that explored the fall of light and shadow across shifting rhythms of shapes and forms, defined by strict mathematical principles. Although her work became no less rigorous or precise, in the late 1970s Spencer started to move away from her previous constructions based on mathematical systems towards a practice of painting; her research into colour becoming a major preoccupation of her work for the rest of her life. Material from the Jean Spencer archive, given to Chelsea College of Arts by her sister after Spencer’s death in 1998 illustrates the depth of her relationship with colour. Containing many previously unpublished examples of personal correspondence, exhibition proposals and Spencer’s own notes and documentation of her work, information contained in the Jean Spencer Archive demonstrates her meticulous processes of research and experimentation in painting and colour theory in the last two decades of her life, and in addition reveals an expanded discourse of feminist consciousness through her sustained practice of constructive abstraction and her working relationships with other artists. Spencer was concerned about ‘radical inequalities’ between different segments of the spectrum in pigment, or perhaps moreover, in human vision through our learned understanding of colour. These ideas coincided with her starting to work with a group of women artists who were engaged in a research project about gender and sexual politics in constructive art, led by sociologist Elizabeth Chaplin in 1982. At Spencer’s suggestion, the women artists involved in Chaplin’s research – all working in what they described as a ‘Systematic Constructive Art Practice’ – formed a collective which she named Countervail, drawing the word from the writings of Julia Kristeva. Peters’ essay discusses the relationships between Spencer’s research into colour theory and the conversations between members of the Countervail Collective into their experiences of working within systematic or constructivist methodologies. The members of Countervail resisted the belief that a constructive art practice based on mathematical principals was an intrinsically male form of expression, rejecting the widely held feminist belief that all forms of rationality were contrary to the female position. The idea of abstract painting having a feminist origin and therefore being political is still not widely written about, and it is difficult to determine abstract painting’s relationship to feminist ideology if abstraction is viewed as a form of individual expression free from political subject matter. Peters’ essay draws on material from Spencer’s archive to suggest that there may be the capacity for abstract painting to move beyond its formal concerns into something more subjective and/or political. Peters, who wrote the essay during time allocated from UAL’s Early Career Researcher programme, said that, ‘I had originally accessed the archive to learn more about Spencer’s individual methodology of colour and its relationship to her painting. 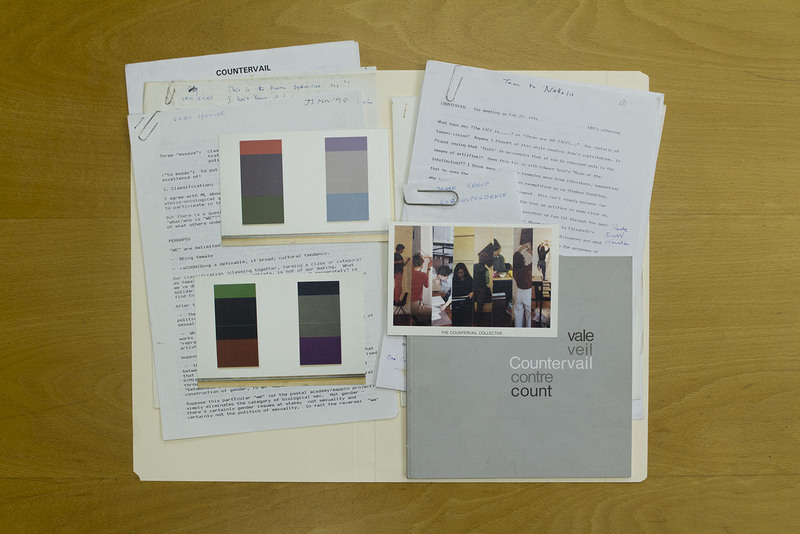 However, when I started to read through the archive of material relating to the Countervail Collective, another story about Spencer’s practice emerged that continued to run in parallel to her investigation of colour, and that suggested a wider discussion about abstract painting and ideology’. Jean Spencer, The Ideological Dimensions of Colour will be published in Turps Banana Painting Magazine #18.